Float among the tree tops while enjoying the fall colors of Northern New Mexico. While a guest as Casa Escondida Bed & Breakfast, we recommend that our guests take in any of the fall chair lift rides that abound in northern New Mexico! Plan your fall visit NOW. The 2013 colors are already fantastic. Casa Escondida Bed & Breakfast is surrounded by downhill ski areas, many of which offer these fun and colorful fall chair lift rides. Casa Escondida is a Santa Fe area B&B, which is located in historic Chimayo, NM (just 35 minutes north of Santa Fe). During your fall chair lift ride, you will love the cool, crisp mountain air, the sounds of nature, the mountain wildlife sightings and more! Angel Fire’s fall Chair lift ride is more than two miles in length. Their chair lift rides are offered on weekends only in October, from 10 AM – 5 PM. Enjoy the ride to the top of one of New Mexico’s highest peaks, where you’ll enjoy a panoramic view of the valley from 10,650 feet. Once you’re up there, take time to hike around the trails or bring a picnic lunch. Tickets are $12 for adults. Seniors (65 +) and kids (7 – 12 years) are only $10 and kids 6 years of age or less are FREE. 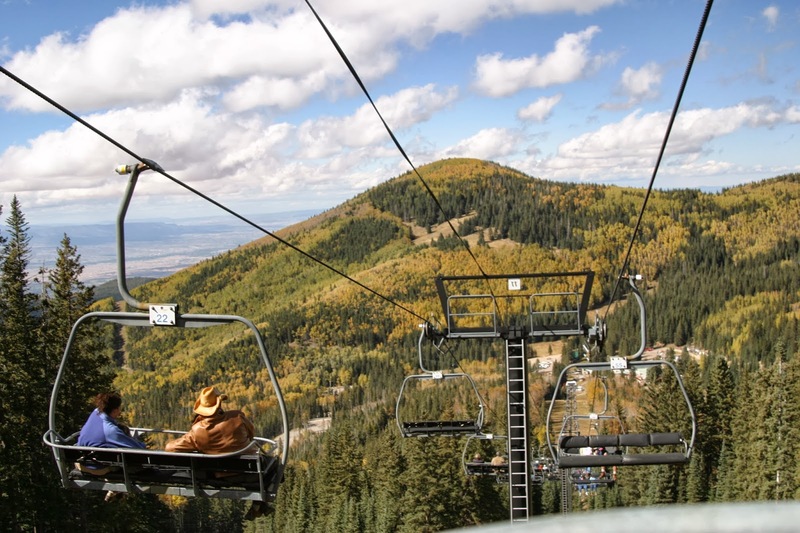 Ski Santa Fe is offering their scenic fall chair lift ride for $12 (round trip) or for $8 (one way) but only through October 13th, 2013. Remember, if you are under 46″ tall or 72 years of age or older, your ride is FREE! In general, remember to dress in layers because the temperatures will vary with the changing altitude during your ride. Even though it is fall, don’t forget the sunblock. Have plenty of water on hand. Wear proper shoes for hiking and of course, have fun and enjoy the colorful mountain views! So when you wonder about things to do during your Santa Fe vacation, put the fall chair lift rides at the top of your list. It is a wonderful way to experience the great outdoors during your New Mexico vacation. Casa Escondida B&B is a delightful New Mexico retreat, which has rooms available year-round. We are perfect for a romantic New Mexico getaway too. Contact Casa Escondida B&B to check room availability or to inquire about a reservation. Casa Escondida Bed & Breakfast is a green bed & breakfast, which provides pet-friendly lodging in 4 of our 8 guest rooms. Enjoy your New Mexico travels AND the fall chair lift rides! We look forward to having you as our guest.